Esri CityEngine is an easy-to-use, standalone 3D editing and visualization tool designed by EsriR&D for users in urban planning, architecture, simulation, entertainment, general 3D content productions, and Geographical Information Systems (GIS). It’s a powerful conceptual modeling and design solution that enables users to intuitively generate and maintain 3D city scenes and buildings as well share the outputs to ArcGIS online. The software delivers unprecedented 3D visualization power to help users monitor the relationships of projects and scrutinize their feasibility before implementing them. Esri CityEngine enables users to view the conceptual representation of buildings and make informed decisions that benefit the community for years. It takes a procedural modeling approach to every project and relies on three key aspects (feature attributes, feature geometry, and procedurally-defined rules) to accomplish tasks. The platform comes in two licenses levels (Basic and Advanced) and works well on Windows, Linux, and Mac devices. Esri CityEngine Basic which comes with single user licensing and is designed to support the file geodatabase. Esri CityEngine Advanced which is designed to extend the functionality of the basic version. This version incorporates professional design and modeling and utilizes procedural technology to facilitate the efficient creation of 3D cities. One of its strengths is the customizable user interface. The interface adapts to your tasks at hand. Whether you are working on a street network, rule creation, studying reports of the current developments, or editing aspects with real-time feedback, Esri CityEngine makes it a breeze. This interface allows you to manage repetitive tasks, automate specific actions, and generate reports in a format of your choice. Another highlight of Esri CityEngine is the ability to create and design 3D urban scene using the existing GIS data. The solution makes it easy to come up with high-quality 3D content by combining procedurally defined rules, 2D data, and attributes. This enables GIS organizations to create spectacular 3D urban environments using nothing more than the data they already have. Better still, the rule-driven 3D city model makes it easy to iterate through multiple design scenarios by changing rule parameters. Additionally, the Dynamic City Layouts allow you to generate interactive street networks which can automatically update in real-time. The parts of a specific urban context including sidewalks, streets, and whole blocks adapt efficiently to your input and deliver an intuitive way to come up with a comprehensive layout of a complete city. In terms of data interoperability, Esri CityEngine is the real deal. It supports the most common formats for data import and export and gives you the freedom to shape data footprints, modify 3D geometry, and transport line data to and out of CityEngine. If you are considering Esri CityEngine it may also be sensible to examine other subcategories of Best Architecture Software collected in our base of SaaS software reviews. Every enterprise has different needs and needs an application that can be customized for their size, kind of staff members and buyers, and the particular industry they are in. For these reasons, no software can provide perfect tools out-of-the-box. When you search a software app, first be sure what you want it for. Read some Esri CityEngine reviews and ask yourself do you want basic tools or do you want advanced tools? Are there any industry-specific tools that you are looking for? Find the answers to these queries to assist your search. There are lots of aspects that you need to reflect on and these include your budget, particular business requirements, your organization size, integration requirements etc. Take your time, use a few free trials, and finally choose the system that provides all that you need to enhance your organization efficiency and productivity. How Much Does Esri CityEngine Cost? 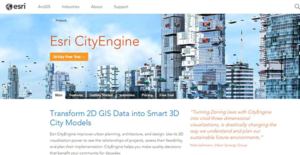 Esri CityEngine doesn’t reveal its enterprise pricing details to the public. Contact the vendor for detailed pricing information. We realize that when you make a decision to buy Architecture Software it’s important not only to see how experts evaluate it in their reviews, but also to find out if the real people and companies that buy it are actually satisfied with the product. That’s why we’ve created our behavior-based Customer Satisfaction Algorithm™ that gathers customer reviews, comments and Esri CityEngine reviews across a wide range of social media sites. The data is then presented in an easy to digest form showing how many people had positive and negative experience with Esri CityEngine. With that information at hand you should be equipped to make an informed buying decision that you won’t regret. What are Esri CityEngine pricing details? What integrations are available for Esri CityEngine?